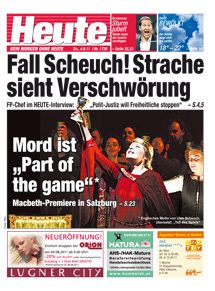 “Heute” is one of the most popular and biggest daily newspapers in Austria. With over 820.000 readers, and that number constantly increasing, I feel pretty honoured about this double spread shot that was taken from an helicopter and the little story with the title “Haifisch-Suppe”, literally translatd into english “Sharkie-Soup” by Martin Huber. Colin Leonhardt from Birdseye View Aerial Photorgraphy, a truly a m a z i n g photographer, really lovely guy and dear mate of mine took this photo and I’m simply lovin’ it! Martin Huber, one of the top-sports journalists of my home turf Austria, is always checking up on me and what Kitegabi is up to 🙂 . This little article is about my wave-training in some rather shark-infested waters off the coast of Australia. Perhaps not the safest playground in the world but the perfect waves are reason enough to get in there! I survived, which is great news 🙂 and Martin Huber shared it with all the Austrian readers. Check out the feature by simply scrolling down and chose whether you want to read the article online, download, save, or print it, it’s all possible and just a click away guys. Find the download button below, simply select and off you go.